When people hear the word "colorblind", many believe it means one can only see in shades of gray. If we go from that definition, dogs are not colorblind. Dogs DO see color. They just have trouble seeing certain color variations. Through this experiment, Neitz discovered that dogs see only certain colors of the rainbow. While a true rainbow is made of violet, blue, blue-green, green, yellow, orange and red, dogs see it differently. They see dark blue, light blue, gray, light yellow, darker yellow, and very dark gray. It’s difficult for them to distinguish green and red colors. Ironically, most popular chew toys for dogs are red, such as the Kong! Want to buy a toy in colors your dog will appreciate? Check out this website I found. 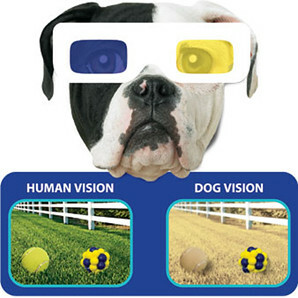 Romp Pet's "High Viz" toys are designed with a dog's vision in mind. Remember: dogs are not truly colorblind, they just have poor color vision! Dogs can check your blood sugar? I am so glad I found your site! This rticle was good. I like that it was short, to the point, and not filled with technical terminology not some might not quite understand. Kudos on a great article. For all this time I thought they only saw in grey scale. You are here: The Smart Living Network ► Dog Breeds ► Blogs ► Are Dogs Colorblind?